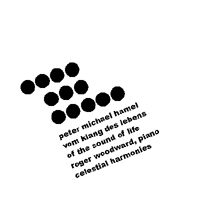 A co-production between Celestial Harmonies and Bayerischer Rundfunk, VOM KLANG DES LEBENS / OF THE SOUND OF LIFE features pianist Roger Woodward on a Steinway model D, playing Peter Michael Hamel's cycle of works composed for and dedicated to his wife and new son. The producer/engineer for the recording sessions in January 2006 was Ulrich Kraus. Long before he discerns the light of the world, still in the womb, nascent man begins to sense the sounds of life. Long before his spirit attempts to differentiate experiences, develop ideas or make his mark on the path of history, he begins to hear the force that creation determined for us. The French doctor Alfred A. Tomatis was able to demonstrate that the sense of hearing is already fully developed in the fifth month of pregnancy. The sound of his mother's voice, the music that accompanies her and the notes that could harmonize with his own personal sounds, all are experienced by the ear while still bathing in the Amniotic fluid. Passionately devoted to all that sound has ever meant to man, the already multiple father accompanied the latest pregnancy of his wife in the early 90s in more than one sensePeter Michael Hamel, an excellent improviser and interpreter at the keyboard, played the piano. He had always delighted in creating metrically complex pulsating rhythms, as if this gift were given to him from the start. In this manner he journeyed into his subconscious, demonstrating, to the joy of the mother and the growing empathy of the yet unborn child, the music of our world. Hamel extemporized and begun to write down short passages: private notes, day by day, month by month new tonal discoveries, revealing the experiences and ambitions of his own life story. Some of these ideasa melody, a turn of phrasefound themselves represented in several pieces. The final embodiment of the music was to be a group of twelve meaningfully arranged studies for piano. Composed over a period of fourteen years, between 1992 and 2006, the cycle can be understood as an idealized diary, embodying central motifs from Hamel's understanding of himself as a person and an artist. The order of the pieces and the general structure of the cycle VOM KLANG DES LEBENS / OF THE SOUND OF LIFE were only determined by Hamel quite late. Two almost identical pieces dedicated to John Cage frame the work: Arrival and Departure, between which are works dedicated to Alfred A. Tomatis, Miles Davis, Morton Feldman, Walter Bachauer, Dane Rudhyar, Pandit Patekar, Olivier Messiaen, Giacinto Scelsi, Iannis Xenakis, and his son, Johann David Antonin. The framework of the whole cycle is a multicultural place of action and of possibilities. Life, and all its sounds are represented symbolically, and new growth can always begin. Maybe that is what Peter Michael Hamel was thinking when he improvised for mother and child: "Primal trust for all." Peter Michael Hamel, born in 1947, ranks as one of the best known and most successful German composers of his generation. He studied music, psychology, and sociology in Munich and Berlin with teachers such as G. Bialas, F. Büchtger, and continued his education abroad, spending three extensive periods in Asia. Hamel has entered into an intense engagement with musical culture from outside Europe, especially the music of India. He has drawn inspiration from Asian philosophies and religions and from his encounters with the works of Jean Gebser and C.G. Jung to present a music that seeks to make itself accessible to the listener through meditative experience and self-exploration. Peter Michael Hamel's other works on Kuckuck Schallplatten/Celestial Harmonies include Colours of Time/Bardo (12046-2), Transition (12063-2), Organum (11074-2), Let It Play: Selected Pieces 1979-1983 (11078-2), The Arrow of Time/The Cycle of Time (11093-2), De Visione Dei (13193-2) and recorded by the Alexander Quartet, Peter Michael Hamel: String Quartet No. 3, String Quartet No. 4, String Trio (13278-2). I Departure/Abreise: In memoriam John Cage 2'49"
II In memoriam Alfred A. Tomatis 1'41"
III Milestone for Miles Davis 8'08"
IV In memoriam Morton Feldman 6'17"
V In memoriam Walter Bachauer 3'11"
VI In memoriam Dane Rudhyar 4'31"
VII In memoriam Pandit Patekar 8'42"
VIII In memoriam Olivier Messiaen 5'31"
IX In memoriam Giacinto Scelsi 8'44"
X In memoriam Iannis Xenakis 2'51"
XI For Johann David Antonin *21.10.1992 3'28"
XII Arrival/Ankunft: In memoriam John Cage 3'35"